I have some cute shoes all on sale to share with you and a few other goodies if you read on! if this Winter made you realize you need new boots, check these out! The Joan of Arctic boots are great for family outings; I saw them at Penn State football tailgating, Fall field trips with my kids, and I saw them on lots of rush hour city walkers this Winter. I would style the boots like Jacie Duprie on the right. She's wearing the Ugg Adirondack. This is an adorable Mom look for Winter. Pair your sale boots with your favorite distressed skinnies (Crew factory has this great pair), a Rails plaid top (once you try Rails, you may never buy a cheap plaid top again), I linked the exact one I have and I use it in 3 seasons for going on 3 years now! Go on the hunt for a sale option if that's better for you, but you must give it a try! Think about buying one second-hand on Poshmark or eBay. Top it with this budget-friendly gray sweatshirt and of course, the ever-popular J Crew coat. 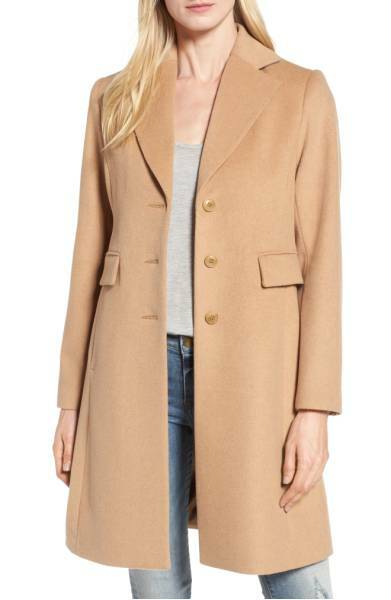 This Kristen Blake Walking Coat on the left is a bit less expensive. This one on the right is from Boden and it's classic/versatile and, just like the others, will be in your wardrobe for years to come! And no ladies, Boden is not too old for us. They have great pieces! Just look at Erin, who we all know and love, from Living In Yellow. The pretty yellow coat is cheery, fun, and on sale. Here's the link: Yellow Boden coat in yellow and a few other colors too! FYI- reviews say it's not as bright a yellow as they were hoping. You will have any of these coats for many years so if you can make the investment, do it. The hat on the right is Janessa Leone` which is not cheap, you can also look here. So excited that lace-up boots are back. If you're under 5'6, I prefer all black on the bottom; no need to break up the leg line if you're petite. But go for it if you don't mind! Black skinnies, black sweater, outfit complete! Adorable rain boots on the left. Add a denim jacket (this one on sale), a trendy tee, with white jeans (these are on sale) and you're all set. Here's a catalog with links to all of these shoes, plus a few ankle booties! More shoe sales here! I think we all know how to style ankle boots by now but, just in case, here’s a look below and you can email me anytime for personalized recommendations. Are you a Mom in transition, style-wise? Read my article from yesterday about getting your style groove back! Discloure: some links are affiliate links which means I may earn a small commission if you make a purchase. This is a small amount that helps support my time spent on the hunt for stylish pieces, these are NOT items sent to me for free. I have created these posts on my own to share with you.